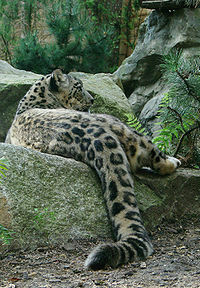 Felis irbis was proposed by Christian Gottfried Ehrenberg in 1830 who described a skin of a female snow leopard collected in the Altai Mountains in Siberia. He also clarified that several leopard skins were previously misidentified as snow leopard skins.Felis uncioides was proposed by Thomas Horsfield in 1855 for a snow leopard skin presented to the Museum of the East India Company. 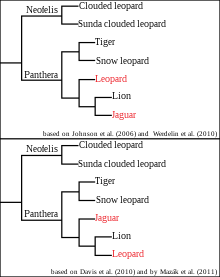 Uncia uncia was used by Reginald Innes Pocock in 1930 when he reviewed skins and skulls of Panthera species from Asia. He also described morphological differences between leopard (P. pardus) and snow leopard skins.Panthera baikalensis-romanii was proposed by a Russian scientist in 2000 for a dark brown snow leopard skin from the Petrovsk-Zabaykalsky District, southern Transbaikal region. ^ Wozencraft, W.C. (2005). "Order Carnivora". In Wilson, D.E. ; Reeder, D.M. Mammal Species of the World: A Taxonomic and Geographic Reference (3rd ed.). Johns Hopkins University Press. p. 548. ISBN 978-0-8018-8221-0. OCLC 62265494. ^ Jackson, R. (1998). "People-Wildlife Conflict Management in the Qomolangma Nature Preserve, Tibet" (PDF). In Wu Ning; D. Miller; Lhu Zhu; J. Springer. 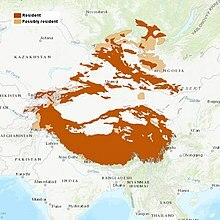 Tibet's Biodiversity: Conservation and Management. Proceedings of a Conference, August 30 – September 4, 1998. Tibet Forestry Department and World Wide Fund for Nature. China Forestry Publishing House. pp. 40–46. ^ Jackson, R.; Ahlborn, G. (1988). 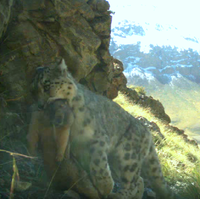 "Observations on the ecology of snow leopard in west Nepal" (PDF). In Freeman, H. Proceedings of the Fifth International Snow Leopard Symposium. 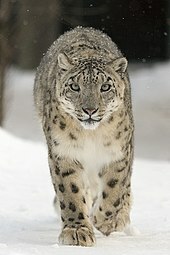 India: International Snow Leopard Trust. pp. 65−97.